It shouldn't really surprise me, but it does sometimes just how many really nice big Magna's there are still out there as opposed to Sabres and Interceptors. 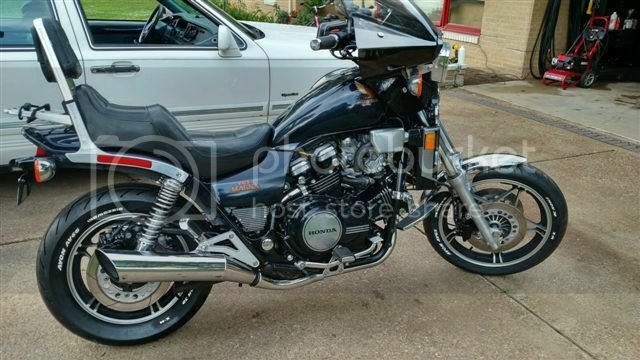 So, I'm going to double up this month and choose another nice V65 Magna. Congratulations Malm, your 1983 V65 Magna is February 2017's Bike of the Month. I have to admit, I'll always have a soft spot for a PSB magna dressed with RWL tires. That's the way they are supposed to look. Moderator in "They all do that, Sir"
Nice looking bike congrats, I've often wanted a fairing like yours for mine. Nice!! Have always liked the PSB color. I walked around one side and said, "yea, it's sold, unless a wheel falls off it's mine...." Test drove it, all was wonderful... Came back, swapped money for the title, did the paper work, came back out to load her up, and she was dripping a little gas... He said "I don't drive her much, and the gasket probably has dried out..." he peeled off $300, handed it back to me and said, "here, get that fixed"
Oniondumper, They don't make the windshield anymore, it is a Memphis Shades Tombstone. Very nice, love that windshield.